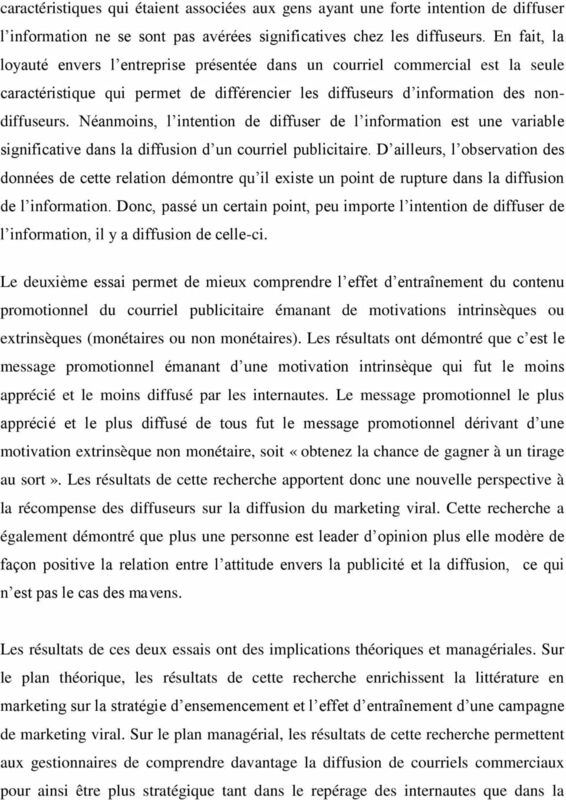 Download "conception des messages commerciaux afin qu ils puissent ainsi accroître la portée de leur message." 3 conception des messages commerciaux afin qu ils puissent ainsi accroître la portée de leur message. 4 SUMMARY In recent years, one of the most popular communication marketing strategies among product managers is without a doubt the use of electronic word-of-mouth or viral marketing (Hinz et al., 2011), specifically the diffusion of commercial s. However, success is not as easy to achieve as it would seem. One way for managers to successfully leverage this strategy is to incentivize for internet users to share these s with their contacts once they have read them. In the literature, this is called the ripple effect. The ripple effect increases advertising effectiveness, which is the goal of marketers and managers undertaking viral marketing campaigns. 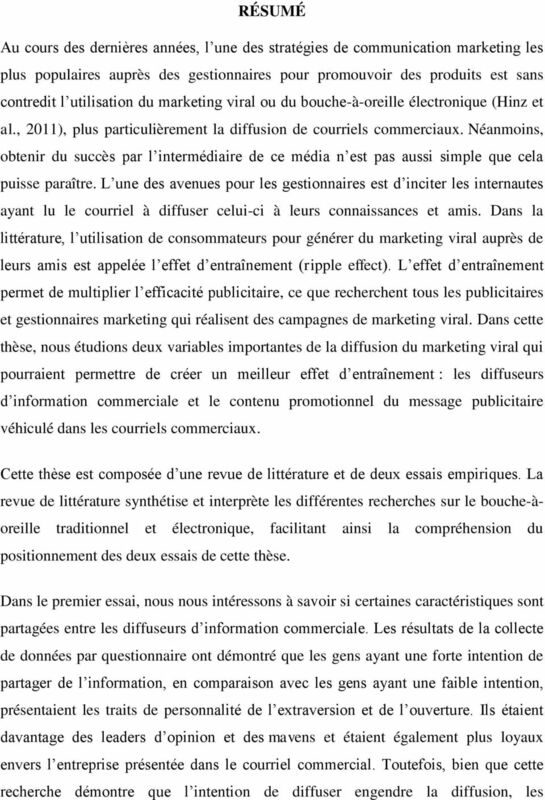 In this thesis we will study two important variables of viral marketing diffusion that could create a greater ripple effect: traits of commercial information diffusers and the promotional content of commercial s. This thesis is comprised of a literature review and two empirical trials. The literature review synthesizes and interprets studies on traditional and electronic word of mouth, and provides a context and background information for the two trials. In the first trial we looked at whether certain traits were shared between commercial information diffusers. Questionnaire results reveal that people with a strong intention to diffuse information, compared to those with a weak intention, tend to be extroverted and open. There were also more opinion leaders and mavens in this group, and more people who were loyal to the company presented in the commercial . However, although this trial demonstrates that the intention to diffuse is associated with actual diffusion, the traits associated with a strong intention to diffuse were not significant in the actual diffusers. In fact, loyalty towards the company in the commercial is the only trait that distinguishes diffusers from non-diffusers. Nevertheless, analysis of the data collected demonstrates that information diffusion has a breaking point. Past a certain point information is diffused, regardless of the level diffuser s intent. 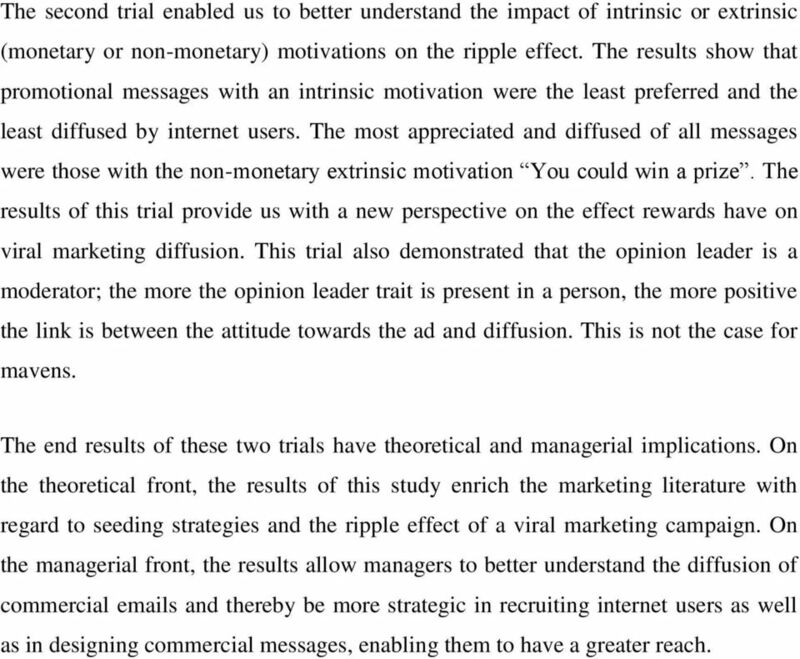 5 The second trial enabled us to better understand the impact of intrinsic or extrinsic (monetary or non-monetary) motivations on the ripple effect. The results show that promotional messages with an intrinsic motivation were the least preferred and the least diffused by internet users. The most appreciated and diffused of all messages were those with the non-monetary extrinsic motivation You could win a prize. 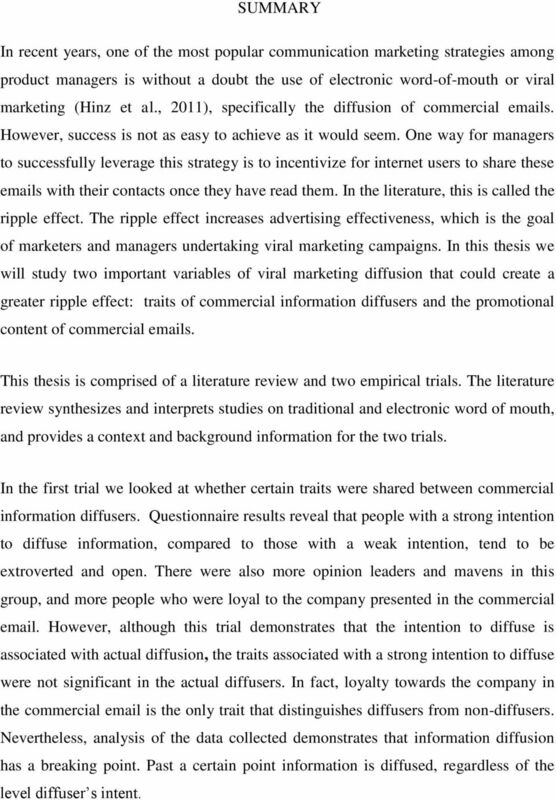 The results of this trial provide us with a new perspective on the effect rewards have on viral marketing diffusion. This trial also demonstrated that the opinion leader is a moderator; the more the opinion leader trait is present in a person, the more positive the link is between the attitude towards the ad and diffusion. This is not the case for mavens. The end results of these two trials have theoretical and managerial implications. On the theoretical front, the results of this study enrich the marketing literature with regard to seeding strategies and the ripple effect of a viral marketing campaign. On the managerial front, the results allow managers to better understand the diffusion of commercial s and thereby be more strategic in recruiting internet users as well as in designing commercial messages, enabling them to have a greater reach. Des stratégies relationnelles : La customisation, la personnalisation et Le marketing viral Séance 6 Anik St-Onge, Candidate au PhD Marketing électronique - DESS HEC 5 octobre 2007 Qu est-ce que la customisation?